After the battle of Tolvajärvi, the units of Detachment P forced the 139th Rifle Division and the 75th Rifle Division, which replaced the former at the front, to retreat to Ägläjärvi. It was conquered after five days of fighting. The forces of the two rifle divisions withdrew to the Aittojoki River. Detachment P’s advance was stopped at this line. The front stabilised at the Aittojoki River until the end of the war. The main responsibility for defending Ägläjärvi fell to the 75th Rifle Division, which had arrived at the front after the Battle of Tolvajärvi (Tolvoyarvi). It was commanded by Brigade Commander Aleksandr M. Stepanov. The troops of the 139th Rifle Division who were still fit for battle after the division’s defeat in the Battle of Tolvajärvi were also grouped into defensive positions. Two rifle regiments from the 75th Rifle Division were deployed in the area of the road coming from Tolvajärvi. Two undermanned rifle regiments from the 139th Rifle Division were deployed in the area of the road coming to Ägläjärvi from the northwest. Detachment P had five battalions at its disposal for the first offensive. In Lieutenant Colonel Pajari’s attack plan, two battalions were tasked with attacking the village from the direction of the road coming from Tolvajärvi. One battalion was tasked with blocking the road between Ägläjärvi and Aittojoki. Another battalion was tasked with advancing to Ägläjärvi from the northwest. The group had one battalion in reserve in the vicinity of the road coming from Tolvajärvi. The offensive started on the morning of 18 December. 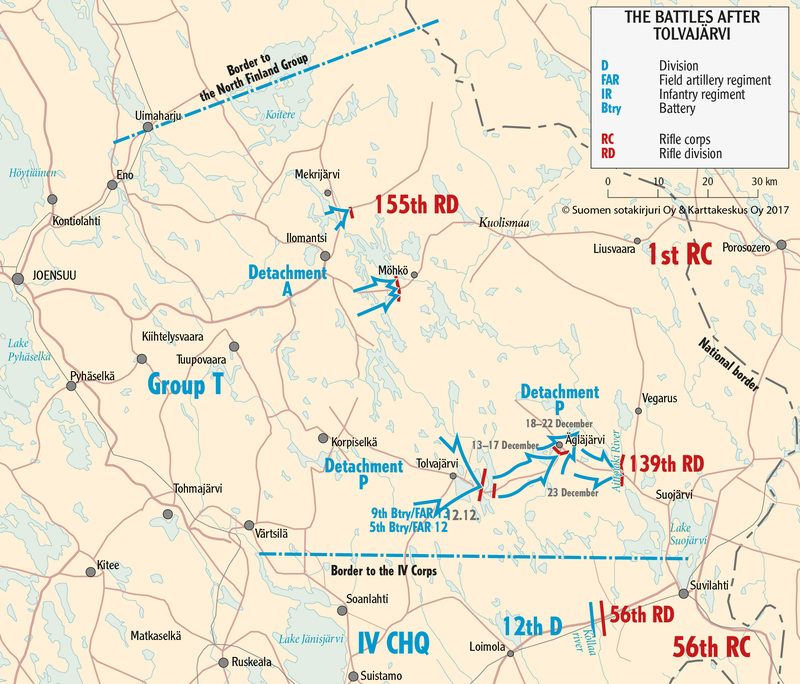 Soviet forces repelled the attacks of Detachment P on Ägläjärvi from both directions. The battalion tasked with blocking the road was forced to return to its starting position under pressure from the enemy. The first attack on Ägläjärvi had failed. Field Marshal Mannerheim called Colonel Talvela during the first battle of Ägläjärvi on 18 December. The commander-in-chief informed Talvela that he had been promoted to major general and Pajari to colonel. The same day, Talvela was instructed by Mannerheim to avoid military operations that would lead to great losses. Talvela considered the capture of Ägläjärvi to be vital and ordered Detachment P to launch a new offensive on 19 December. It did not lead to any significant success. The troops of Detachment P were very tired on the evening of 19 December. Colonel Pajari demanded for rested troops, but there were none. Major General Talvela gave Pajari permission to abort the offensive if necessary. However, Pajari decided to continue the offensive the following morning. The Soviet forces defending Ägläjärvi lost their outermost positions in the fighting on 20 December. Like his troops, Pajari was very tired. In the evening, Talvela ordered Pajari to rest. Talvela appointed Jaeger Officer, Lieutenant Colonel Kaarlo Viljanen to replace Pajari as commander of Detachment P. He prepared an attack plan for the following day. It required changes in troop formations, which were implemented the following day. The forces of Detachment P attacked the village of Ägläjärvi from different directions on the morning of 22 December and broke through the enemy’s defences. By the end of the afternoon, the village was fully under the control of the Finns. Some of the assault troops were formed into a pursuit detachment, which departed in the evening to pursue the enemy forces retreating towards Aittojoki. 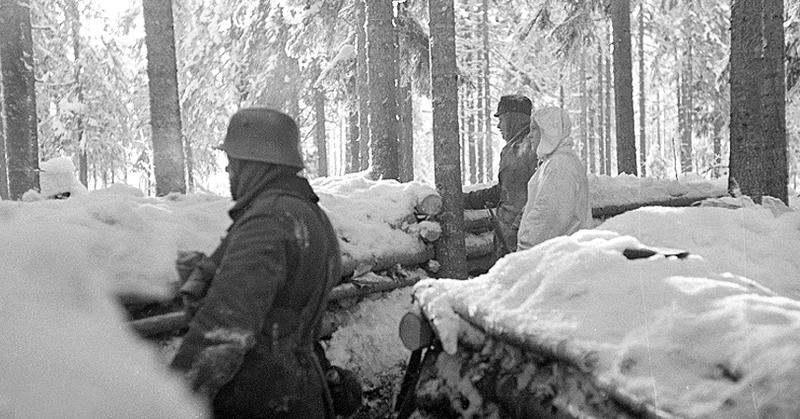 Men from Detachment P in a trench in Aittojoki in December 1939. SA-kuva. On 23 December, the pursuit detachment handed over the responsibility for the front to a battalion that had primarily been in reserve on the day of the capture of Ägläjärvi. The battalion encountered the enemy’s defensive positions in Aittojoki. Pajari returned to Detachment P’s command. Talvela ordered Pajari to group the troops in defensive positions on the west bank of the Aittojoki River.